Hair No More vanishing creme for hair gently removes your hair from the follicle bulb, thus leaving your skin silky and soft like a baby. Creme comes with a protective natural barrier that is pro-vitamin and contains an anti-oxidant complex that consists of green tea, aloe vera, vitamins A & E, and natural plant extracts. This results in painless removal of your hair. Your hair will become finer and thinner with repeated use over a one to four month period of time. Some even claim that hair stops growing permanently with ongoing use. This is a 3-in-1 process that moisturizes, protects, and conditions the skin against the harmful effects of the environment. Two additional products are available, Advanced Hair Inhibitor Gel and Advanced Hair Inhibitor. You will find that this product is fast and effective at removing hair. Even though this is a powerful formula it is also mild, yet it does remove all the hair you apply this cream to. Will work at removing even thick hair in around eight minutes. Mild enough to even use on your bikini area without having your skin irritated. 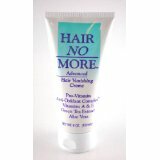 With this product you need to keep in mind that it is a hair inhibitor, not a hair remover. That means it will only work to keep your hair from regrowing, but won't remove it. Plus, you have to keep up the treatment for as long as you want the hair to remain gone. Once you stop using the treatment as per the instructions, it will no longer work. Your hair will return and remain until you start the treatment up again. This is similar to the product above, except that is a gel and this is a spray mist. Your results and treatment remain the same. Use daily to keep your hair from regrowing. Just keep in mind it doesn't remove hair already on your skin, it only inhibits hair. That means you need to pluck it, or remove it first in some other way. You need to keep up the daily treatments or your hair will return. Slow Grow Skin Maintenance Lotion Hair Inhibitor 8 Oz 236 Ml - Ships in 24 Hours!